The purpose of this indicator is to save time and detect more good trading opportunities by scanning all 28 cross currency pairs of AUD, CAD, CHF, EUR, GBP, JPY, NZD and USD in the same time. 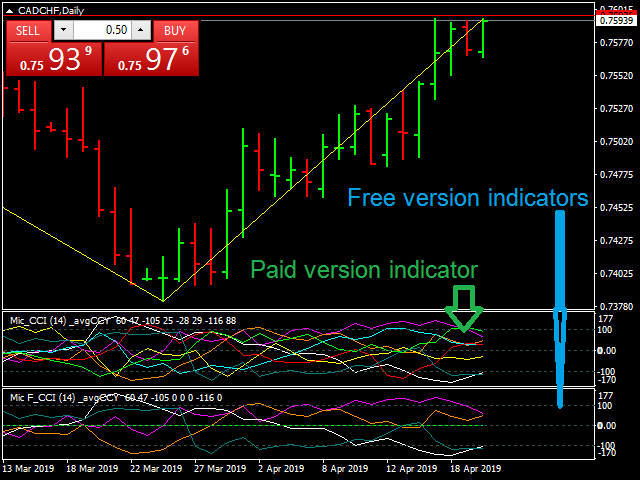 There are 5 indicators included in this indicator which are CCI, RSI, Stochastic, MACD and the different between plusDI and minusDI of ADX (PlusDI-MinusDI). The indicator can help in determining an average direction, stability and strength of trends, support/resistance zones or even reversal confirmation of each currency depending on which indicator we selected and the setting of its parameters. Linear indicators and data dashboard are available in the same time. Indicator for cross currency pairs of the selected currency, 7 pairs for each currency. In case of the selected currency is a quote currency in a pair, the indicator will show its reverse value in order to make it easy to determine an average direction of the currency i.e. 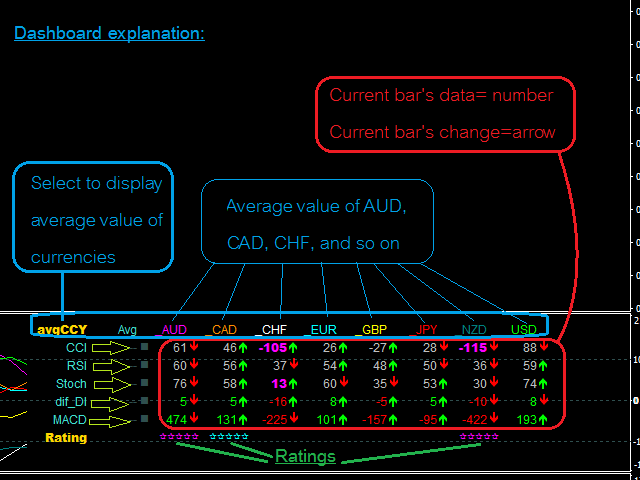 if we select to view AUDxxx, the indicator will plot reverse value of EURAUD for AUDEUR. Data dashboard. The data dashboard always displays current value and its changing from previous bar of all indicators. Current values are displayed in numerical while changings are in arrow format, up arrow in lime color for changing up and down arrow in red for changing down. Data can be an average value of currencies or an indicator value of cross currency pairs related to the selected currency. This is depending on the selected display format. Rating. The bottom line of the data dashboard shows rating result of the currency or currency pair named on the top line of each column. Number of rated star depicts numbers of indicators that changed up or down from previous period. Rating result on higher time frame is more reliable than in shorter time frame. Alerts. Alerts will perform immediately if the currency or currency pair has rated to the defined level. If rating of the currency or currency pair becomes fallen below rating criteria after rated, it will be confirmed once finished the time frame period. Reading and interpretation of currency indicator is in the same way as the indicator for currency pair. A steep indicator for any currency depicts its stronger trends. A higher rated currency confirms its trends stability. Simply pair the currency that has rising indicator with the currency with falling indicator to get a trending pair for trade. 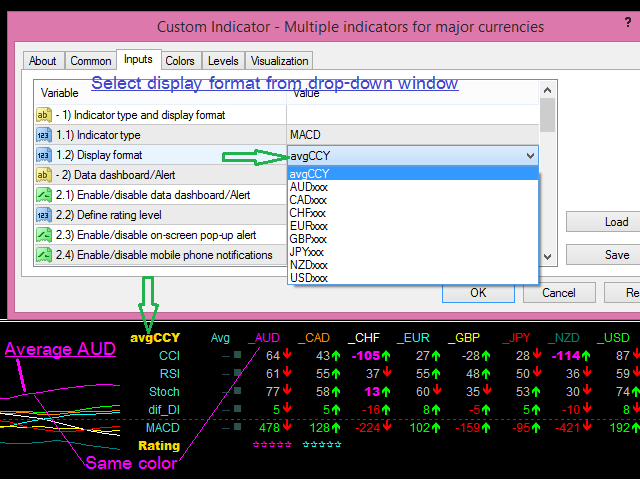 avgCCY: an average value of any currency, select this display format we will see an average direction of each currency. AUDxxx, CADxxx, CHFxxx, EURxxx, GBPxxx, JPYxxx, NZDxxx and USDxxx: an indicator value of currency pairs for AUD cross currency pairs and so on. Select this display format to see whether moving directions of cross currency pairs of the currency are all in the same or in different directions. Enable/disable data dashboard/Alert, select 'true' to enable or 'false' to disable. Define rating level, select level of rating criteria(4 or 5 stars) to display on the data dashboard. Enable/disable on-screen pop-up alert, select 'true' or 'false'. Enable/disable mobile phone notifications, select 'true' or 'false'. 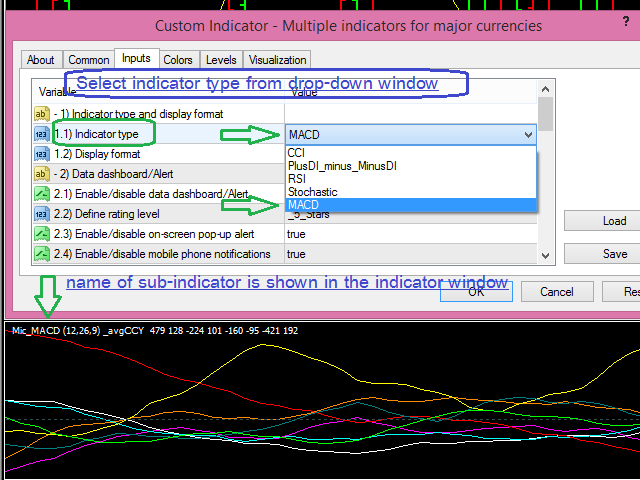 Indicator parameters, defines the parameters of all relevant indicators. Define number of digits for indicator values. Assign color for the indicator lines. The indicator will not perform properly in the strategy tester. Color of line is the same as a name of currency/currency pairs on the data dashboard. 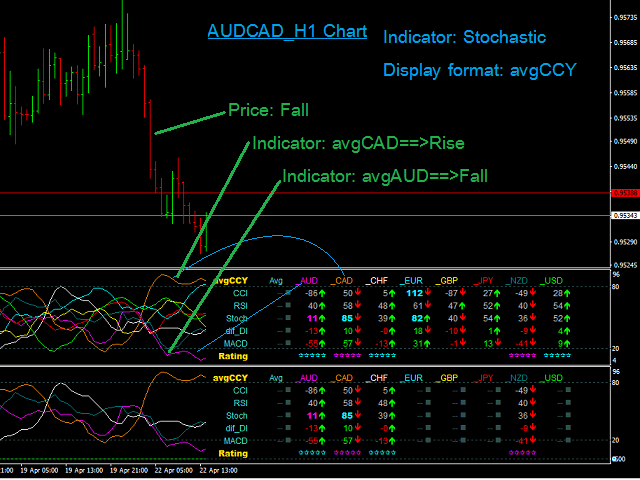 The free version does not display the indicator of all currency but only displays AUD, CAD, CHF and NZD. Improvements are described in overview section.